Have you ever been tasked with finding an English translation of a recently enacted ordinance in Hong Kong when all of your colleagues in the Hong Kong office on the other side of the world are asleep in their beds? Have you been asked to help a member of the law journal reverse engineer and decipher an esoteric citation to a Chinese regulation that has been translated into English? Have you ever been asked by your favorite law professor to figure out whether the State Council of the People’s Republic of China has translated its open government information regulation into English? The Asian American Law Librarians Caucus (AALLC) program on Chinese legal information, held on Monday, July 20 from 4:30pm to 5:30pm, was designed to help you to handle these problems and others like them that you may have already encountered or will likely encounter in the future. Alex Zhang, from the University of Michigan Law Library, and Anne Mostad-Jensen, from the University of North Dakota Law Library, explored some of the most practical yet important issues related to English translations of Chinese primary legal materials, such as availability, accessibility and quality control. Before using any English translation of primary legal materials of any jurisdiction, it is important to understand and fully appreciate the characteristics of the legal system and infrastructure. The Chinese legal system is a mixed legal system composed of the socialist civil law system of Mainland China, the common law system of Hong Kong Special Administrative Region (HKSAR), and the civil law system of Macao Special Administrative Region (Macao SAR). Each section has its own official language that directly impacts the authority and availability of English translations of primary legal materials. For example, in Mainland China, the official language is Mandarin Chinese nationwide. As a result, English translations, regardless of its issuing organ, are only for informational purposes. On the other hand, English and Chinese are both official languages of HKSAR and therefore, English and Chinese versions of primary legal materials issued by the official governmental entity are considered equally authoritative. Macao SAR is unique in the sense that Chinese and Portuguese are both considered as official languages. Consequently, English translations are of informational purposes only. The different legal systems and framework also impact the availability and accessibility of English translations of primary legal materials in all three jurisdictions. With English as one of the official languages, English versions of primary legal materials of Hong Kong SAR are the most accessible among the three jurisdictions. Legislation in both English and Chinese is available through HKSAR Department of Justice Bilingual Laws Information System. The website also provides glossaries of legal terms prepared by the Law Drafting Division of the Department of Justice. Similarly, Hong Kong Judiciary’s Legal Reference System provides the full text of court decisions in English. The PRC government is making progress toward making its laws available in English. Both the National People’s Congress and the State Council have been publishing English translations of selective laws and regulations since the late 1970s. Furthermore, both branches have made laws and regulations in English available online. For example, the National People’s Congress launched the online database Laws and Regulations in English in 2006. Its Chinese Law database also provides English translations of certain laws and regulations when available. Commercial vendors, such as Chinalawinfo, Westlaw China and Lexis China all provide extensive English translations of primary legal materials from Mainland China. Users may have the least luck when it comes to finding English translations of Macao laws and regulations. Both Chinese and Portuguese versions of the laws and regulations of Macao are readily available at the Macao SAR Legislative Assembly website, but English versions are not included on the website. The Government Printing Bureau of Macao does make English translations of certain major codes available at its official website, including both the Commercial Code and the Industrial Property Code. On the other hand, making translations available does not necessarily indicate the quality of the translations. Translation is hard. Legal translation is even harder. Deborah Cao claims “the sources of legal translation difficulty include the systematic differences in law, linguistic differences and cultural differences.” Olga Burukina argues that legal translators are constantly challenged with “time and quality issues as well as a number of contradictions” related to time, systems, terminology, meaning, etc. Relying on a misleading translation is worse than not relying on a translation at all. Therefore, both presenters spent time discussing issues and concerns with the quality of the currently available English translations of all three jurisdictions. The presenters provided concrete examples of some of the major concerns, such as inconsistency, lack of officially issued bilingual legal terminologies for Mainland China and Macao SAR, and omissions and additions of words from the version in the source language. At the end of the presentation, presenters also shared tips and strategies for using English translations of Chinese primary legal materials with the audience. If you would like to receive a copy of the presentation materials by email, please feel free to contact Alex Zhang (zxm@umich.edu) or Anne Mostad-Jensen (anne.mostadjensen@law.und.edu). HKSAR judicial decisions are issued either in Chinese or in English, with a majority of cases still issued in English. Judicial decisions of jurisprudential value originally issued in Chinese are translated and made available in English as well. See http://legalref.judiciary.gov.hk/lrs/common/ju/tjpv.jsp. Deborah Cao, Translating Law 23 (Multilingual Matters, 2007). Olga Burukina, The Legal Translator’s Competence, 5 Contemporary Readings in Law and Social Justice 809, 810–812 (2013). 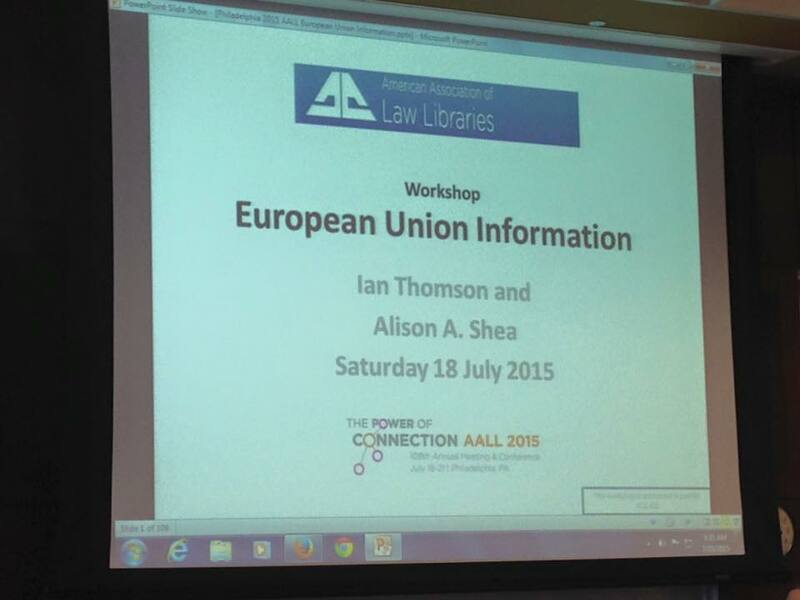 I was lucky enough to attend AALL 2015’s preconference workshop on EU Information, along with the rest of a sold out crowd. Our speaker was Ian Thomson, who serves as both the Director of the European Documentation Centre at Cardiff University and the Executive Editor of European Sources Online. While not a complete EU novice, I learned about a host of new (to me) resources beyond EUR-Lex that will be a huge aid next time I teach our International and Foreign Legal Research course or have patrons come with EU questions. Rather than give a summary of the topics discussed, I thought I would highlight ten resources I didn’t previously know about that will be helpful to those out there researching European Union-related issues. ECLAS is a major bibliographic index to help researchers find EU publications, treatises, journal articles and more on topics of interest to the EU. ECLAS provides hyperlinks to full text if freely available. The Registers of Documents from European Union institutions are a fantastic research tool for finding unpublished EU information not available in other EU-focused search engines and databases. Each of the registers includes documents relating to its activities, as well as official documents sent to it by other institutions and EU member states. The three main bodies of the EU, the European Parliament, the European Commission, and the Council of the European Union each have their own register. Use European eJustice Portal to find links to information aimed at many different audiences (citizens, businesses, legal practitioners, and judges). Among other resources, researchers can find EU member state legislation and case law, as well as information on the legal processes in each EU member country. Use the EEAS to find summaries of and information on the European Union’s relations with every country. IATE is the official database for interpreters of the EU. Researchers can enter an important term for their research and find the translation in over 20 languages. The EPRS, the European Parliament’s internal research department, provides the European Parliament with analysis and research on policy issues important to the European Union, in the form of briefings on current topics. IPEX provides access to reports from national parliaments concerning EU legislative proposals and initiatives. Dec.Nat helps researchers find court decisions from the national courts of member states concerning issues related to EU law. Euro|topics translates articles from EU member country sources from their original language into German, English, and French. It provides an interesting way to get into the mindsets of media in other countries. Their “Main Focus” section gives articles on one hot topic of the day and then provides a list other news items of note. For more help finding useful websites and databases for information on the European Union, see Thomson’s own Europe on the Internet. It’s incredibly comprehensive and covers a great deal of what attendees were shown at the workshop. Following up on the recent discussion of Hein’s World Treaty Library, I’d like to report on my experience trialing it at the same time as the Oxford Historical Treaty product. If you are at all like me, you were somewhat confused about Hein’s Historical Treaty Index, which I now understand to mirror the index from Parry’s Consolidated Treaty Series. It appears that Hein identified the full text and Consolidated Treaty Series cite for bilateral and multilateral treaties and included the text in its library. My understanding is that the series is not complete, but Hein is working towards completion. 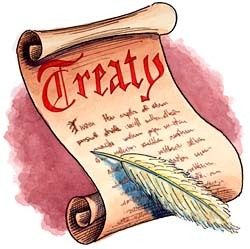 To be perfectly clear, Hein provides researchers with the text of the treaties that would be available in the Consolidated Treaty Series, but does not provide the official Consolidated Treaty Series. A month ago, during a conversation with colleagues from schools in the northeast, I reported a critical strength for the Oxford product was the ability to run a full-text search. I believed that one could only search the index on Hein, but Steve Roses from Hein later informed me that I could search the full-text. In light of my misunderstanding, Hein listed the Historical Treaty Index as a “document type” on the full text search option (email to me from Steve Roses on 11/17/2014). In my opinion, Oxford Historical Treaties does contain enough other advantages to make the purchase worth serious consideration. 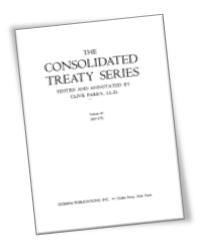 Most obviously, it provides pdf images of the Consolidated Treaty Series. Anyone who is familiar with the interface of one or more of the other Oxford products will immediately recognize Oxford Historical Treaties, which will make navigation simple for users. The filters (content type, treaty type, party, date, etc) will be useful for empirical or comparative work. Most notably, Oxford Historical Treaties is integrated with the Oxford Law Citator, which links to other Oxford products, such as Oxford Reports on International Law and Max Planck Encyclopedia of Public International Law as well as commentary in Scholarly Authorities in International Law. For example, when I run the Citator for Treaty of Peace between Austria-Hungary, Bulgaria, Germany and Turkey, and Russia, signed at Brest-Litovsk, 3 March 1918 (223 CTS 80) I am currently able to pull up 19 references to the item, including a PCIJ decision, nine Max Planck articles, and commentary from several scholarly titles. When you first open the World Treaty Library, you see the horizontal, light blue banner just below the title that is labelled “Browse Options.” The majority of the options in this section list their contents by title for browsing and the titles link to full-text. All the databases in Browse Options follow this pattern except the Treaty Index and Bibliography. The records in the Bibliography database are all linked to their WorldCat records by the ISBN or OCLC number. I seem to have gotten too used to full-text databases from HeinOnline’s other libraries so I found myself wondering how useful the bibliographic records are. Perhaps I’ve forgotten the days when ILL was new. The Treaty Index is the default link that is selected when you first bring up the World Treaty Library. Although the Browse Options banner is still at the top, it is the databases in the white box below the templates that are now active. These databases are all indexes, although the bibliographic records in the United Nations Treaty Series, Hein’s U.S. Treaty Index, Historical Treaty Index, Martens’ Treaties, and the League of Nations Treaty Series link to the full-text of the treaties. The strengths of the World Treaty Library are the complete holdings of full-text treaties in Major Treaty Collections; Historical Treaty Index, U.S. Treaties and Agreements; and U.N. Treaty Publications. I would add Scholarly Articles to this list because it pulls articles about treaties from the Law Journal Library. Although the U.S. and U.N. treaty collections are duplicated from other HeinOnline libraries and widely held on their own, Major Treaty Collections holds things that are rare such as the British Foreign and State Papers 1814-1968; Martens Treaties 1817-1944, which itself includes 9 more titles; and J. Dunont’s Corps Universel Diplomatique du Droit des Gens (1726-1731). I would also add Hein’s sophisticated search capabilities including template selections specific to treaties such as treaty numbers and operators such as grouping, field grouping, fuzzy searches, and boosting. A third strength is the external sources that include many authoritative library subject guides to treaty research as well as some lists (Avalon and Canada) and explanations of treaty practice and procedure . The one clear weakness that I can find is that the World Treaty Library lacks the full-text of the Bibliography database citations, Rohn’s World Treaty Index, and Multilateral Treaty Calendar. Finally, let me give Catherine Deane’s AALL blog post its due. Although she concludes that the World Treaty Library is worth buying, she explains its strengths and weaknesses. The weaknesses include the duplication of the U.N. and U.S. treaty collections from other HeinOnline libraries. Catherine turns this on its head, however, by noting that the World Treaty Library allows us to search all these databases at once. Catherine rightly finds that the extra cost of duplicate content is reduced by the discount for the duplication for Core and United Nation Law Collection subscribers. She also concludes that “…the duplicative materials seemed to be a fairly small portion of all of the documents offered in the World Treaty Collection….” This point also turns out to be both a strength and a weakness. Hein says, “Approximately 50% of the content in the World Treaty Library is unique to the collection.” (Email from Steve Roses to Susan Gualtier, 13/2/2014.) Therefore 50% is duplicated. In the end it seems to me that the question is whether the discount pays for the duplication. I’ll leave it up to you to decide. For Catherine some of the World Treaty Library’s features are both strengths and weaknesses. You’ll have to judge which one they are for your situation. As I said at the beginning, this library is monumental and complex. Its enormous content and Hein’s strong searching capabilities recommend buying it. I say this, however, without comparison to other sources and a number of features that are both strengths and weaknesses. In the end you’ll have to judge yourself whether those features are strengths or weaknesses to your library.